Except for a few highlights this would be a very standard beach. 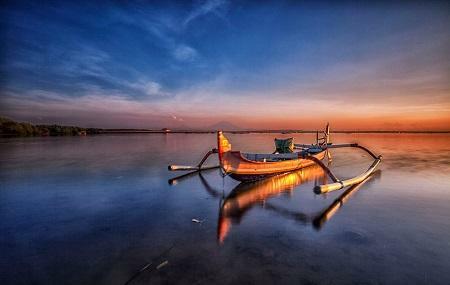 It is located on the west coast of the island of Bali which means the sunsets are beautiful. It is directly south of the airport, and watching the planes take off or come in during sunset can make for some beautiful photographs. The waves at the beach are not very high and the water is shallow, making it family friendly. A handful of excellent restaurants are lined up along the length of this week. Absurdly, one of the main reasons this beach is popular is because Paris Hilton once took an Instagram picture of herself and her friend over here. Take a bemo, ojek, or taxi to here. Exotic place to enjoy sunset near airport runway. Nice beach for the locals. Almost there's no foreign tourist in this place. A lot of fisherman, farmers of marine algae, fishing boats and cart merchants......just because the crowded, it doesn't mean you can't enjoy the relaxing moment..... The unique is, this beach side by side with Ngurah Rai airport runway, so just walk along the beach to wait sunset, it's very beautiful, especially when the planes want to landing at the runway, you can watch the planes landing or take-off with the sunset background.......wow! You just paid small fee to enter the beach and you can drive your car to reach the ending road of the beach......enjoy! This beach is located right next to the airport. Nice beach to relax, enjoy the view & the sunset. You could even watch the planes leaving the airport.